Good day cat lovers and what a good day it is. It’s Mondays with Merlin and we an had an unexpected visitor on our porch. We always have several nests and it’s fledgling season. I was sitting in my favorite chair while my mom, Layla swept the floor when out of the blue, a nestling no more than a few days old fell at her feet. Undaunted, she placed it back into the nest. Five minutes later another nestling fell at another location no where near a nest. She figured it was a sign. Every year there are casualties. It’s survival of the fittest. Some are pushed out of nests, some lose a parent, some flop on the ground and meet their fate. Some get lucky and are placed back into a nest or are assisted in their first flight without the gaping jaws of cats. I admit to catching a bird or two in my life but they aren’t my prey of choice. This tiny creature got lucky. Layla placed a basket up near another inaccessible nest where chirping could be heard. The next morning, Odin made a beeline to the basket, annoyed he couldn’t reach it. Layla lifted the basket down to check on the bird. It looked dead. No surprise. The survival rate for nestlings is low. Layla carried the basket and a shovel to the edge of the garden and dug a hole. The tiny featherless thing looked shrunken but in her hand it pulsed and wriggled. In that moment, the day changed for both of them. It’s hard to change the world but we can change one life at a time. Eye droppers appeared, a softer nesting material, warm hands cupping the weightless bird in Reiki healing energy. Its mouth opened and gobbled a bit of watermelon but nothing else. Gris Gris came over, curious but one stern look from Layla and he backed off. She looked worried. There were a million things to do as always and she was sitting on the porch holding a bird nobody wanted. Time or no time, something had to be done. They’d brought a fledgling robin last year to a wildlife rehabber and Layla called her, praying she was home. 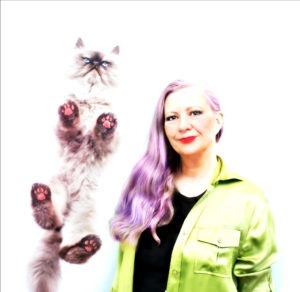 She’s one of these angels who quietly saves animals in Yonkers. Thankfully my cat daddy dropped everything to drive Layla while she continued giving Reiki in the car. Funny how all schedules cease to be important when it’s a life or death situation. The wildlife expert gently handled the bird while Layla filled her in on what happened. The bird-like middle-aged woman said, “There’s a reason birds are pushed out of the nest. There’s sometimes something wrong with them. It needs some heat and then we’ll see.” A minute and a donation later the bird shifted from Layla’s responsibility to the best possible hands. The odds are against survival but there is always hope. I mean, look at me, I’m still kicking. A little bird told me life is precious and there’s nothing stronger than the will to live. May your life always be open to little birds. Time is running out. 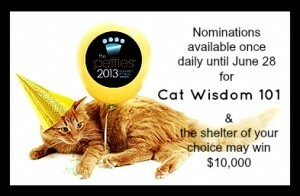 Only 5 more days to nominate all your favorite pet blogs. Anyone know if that bird in the first shot is real?? Amazing! Matt, yes it’s real but sadly it didn’t make it. What a beautiful story! times like this give one the opportunity to pause and reorient to the miracle of life. I hope the little birdie survives! The story sounds like a fairy tale. Hopefully it’ll end like one. Sometimes they are pushed out by bigger siblings who hatched before them, and sometimes another species will lay an egg in the nest and the hatchling tosses out the rightful inhabitants. So maybe the little bird is healthy and will live a long life. We’ll be purring that happens! 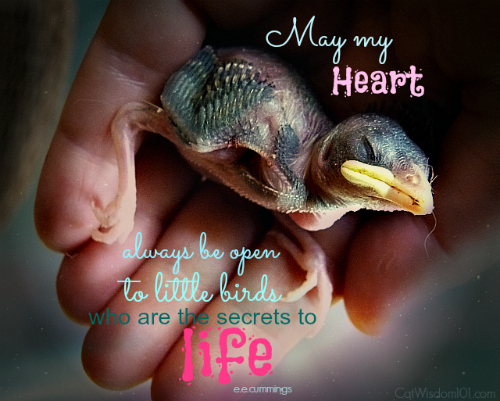 Our hearts and souls and minds are always open to little birds…. 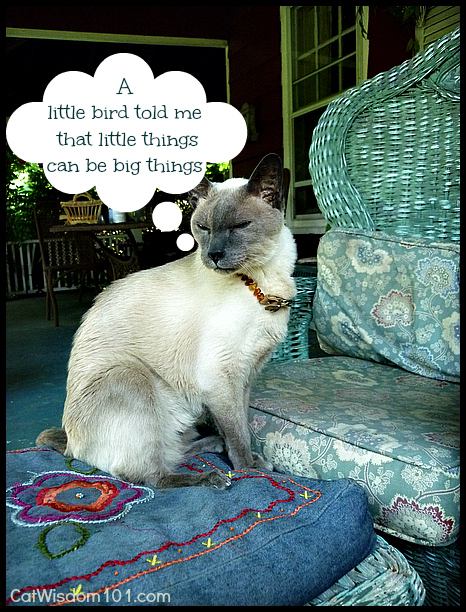 I sure enjoyed your post as we have saved many of a distressed birdie that wanted to live. We had a nest full of babies wrens. Yesterday sometime in the morning something happened (a snake maybe?) and all four babies are gone. The parents are still bringing food to the nest. Our post for next Thursday will have the update from last Thursday about the nest. It’s sad, but it’s nature. And it cruel but it’s the life cycle. The very old and the very young are the most susceptible. How awful. You think they fell out of the nest or maybe raccoons? Layla what a wonderful post. I so hope the little bird makes it. Thanks for helping it. Oh we are so glad you tried to help that little baby bird.. It was meant to be that the bird fell near you. So we will keep our paws crossed that maybe the bird will make it. How wonderful that you know someone that could help the little bird. What an inspiring post! The little bird is lucky to be saved by you and taken care of by wildlife expert lady. Little things can be really big things. I hope the little bird will survive. Into every life some tiny fledglings fall. Thank you for not turning away Layla. At least this little one has a shot, something s/he wouldn’t have had otherwise. Well done to your humans, and to the woman who takes in the wild critters. The wildlife rehabber is truly an angel. uz while we tell her what ta rite iz saying de blessings oh st francis two de wee burd…. uz tabbies…….ya noe de storee…. Your mom is very sweet and kind to try and save such a tiny life Merlin..
that was an exceptionally beautiful piece and so kind. Did you have gloves on when you put the bird back into the nest? I have read that mother birds will reject their young if they smell the scent of the human touch on them. Caren, birds have a poor sense of smell and mom birds don’t reject their young if they’ve been touched by humans. It is important to wash hands afterward since birds can carry bacteria, mites etc. So beautifully told, Merlin. Where there is life, there is hope, and if we can help, we should. What a sweet story. We wish that little birdie luck…but we know how nature can be. What a dear story……I too believe that mother nature knows best but when you have a chance to try and help the helpless then why not……if it was meant to be your Mom’s kindness in trying to give the baby bird a chance will pay off and if not, the joy sometimes is simply in TRYING. Happy Monday Merlin! Let’s make it a good one! Oh dear, I’m afraid I’m on Odin’s side here… I am a fierce hunter, after all! Oh my, what an amazing story. I often think of little birds that fall out of the nest or that their mothers push out of the nest. Your story is so heartwarming and tender — I will continue to hope. Please keep us posted.